St Mary’s School has a responsibility to create an understanding and appreciation of Aboriginal peoples, their histories, cultures and spirituality. Download the full Aboriginal Education Policy. All students have the right to experience quality education and care in an environment that provides for their health, safety and comfort. By implementing clear procedures for the administration of medication to students we aim to reduce health risks to students as a result of incorrect administration. Download the full Administration of Medication Policy. Assessment of the students’ development and learning is an essential component of the curriculum, and helps to inform continued development, learning and teaching. Download the full Assessment and Reporting Policy. The aim of this policy is to establish what is expected with regard to student behaviour, and to state how St Mary’s School will respond to student misbehaviour. Download the full Behaviour Management Policy. Download the full Bushfire Plan. All planning and development in Catholic schools is undertaken within the relevant requirements of government and regulatory authorities. The School Board is responsible for planning at the local level and thus for ensuring that CECWA and Government requirements are met. Download the full Capital Planning and Development Policy. School retreats are an integral part of the life-long faith formation of young people. They promote systematic, intentional catechesis as part of the comprehensive evangelisation of students. Download the full Catholic School Retreats Policy. Catholic schools are entrusted, in partnership with parents/guardians/caregivers who are the primary educators of their children, with the total education of the child. Catholic school staff therefore have a duty of care to students during school operating hours and at other times when a staff/student relationship exists. Download the full Child Protection Policy. Christian Service Learning provides students with opportunities to acquire the knowledge and understandings of love, compassion, justice and service as articulated in the Gospels and to apply their knowledge and skills to real situations in society. Download the full Christian Service Learning in Catholic Schools Policy. A Crisis Management Plan enables St Mary’s School to respond in a planned and thoughtful manner in a crisis. We acknowledge that as a social system any crisis will impact throughout the community and that our planned response will assist members in their period of turmoil. Download the full Crisis Management Planning in Catholic Schools Policy. St Mary’s School has introduced Crunch&Sip to support students to establish healthy eating habits whilst at school. Download the full Crunch & Sip Policy. Curriculum is dynamic and includes all the learning experiences, both planned and unplanned. It encompasses the learning environment, teaching methods, the resources, provided by schools and early learning and care centres to facilitate the learning of students and young children, assessment, the school ethos and the ways in which students and young children and staff behave towards one another. Download the full Curriculum Policy. Debt Servicing Income and Assistance aims to form a partnership with all schools to ensure schools have equitable access to the resources and support they need to participate in their own development, that Catholic Education Western Australia (CECWA) debt is sustainable and that systemic debt remains within means as far as resources allow. Download the full Debt Servicing Income and Assistance Policy. Catholic Education is committed to ensuring that disputes and complaints are dealt with fairly, objectively and in a timely manner, and that processes reflect the principles of participation, co-responsibility and subsidiarity. Download the full Dispute and Complaint Resolution Policy. Catholic education celebrates parents as children’s first and most influential educators and recognises that strong, collaborative partnerships between parents and educators are essential. Educators and educational leaders work collaboratively with parents to foster children’s spiritual, physical, cognitive, social and emotional learning and growth. Download the full Early Childhood Education and Care Policy. St Mary’s School has the Emergency Evacuation Plan in place to ensure all members of the school community (students, staff and families) are adequately supported to minimise the stress associated with crises and traumatic events. Download the full Emergency Evacuation Plan. St Mary’s School exists to further the mission of the Church. In Western Australia, the Mandate of the Bishops requires the Catholic Education Commission of WA to make Catholic school education available to all Catholic children, as far as resources allow. Download the full Enrolment Policy. Exclusion is an extreme disciplinary action reserved for cases of gross misconduct, serious breaches of school rules, or repeated behaviour that is persistently disruptive. Given the significant implications for the student and their family exclusion is, therefore, to be applied as a last resort. Download the full Exclusion of Students for Disciplinary Reasons Policy. Students at St Mary’s School are educated to understand that they are spiritual beings in relationship with God who live in physical bodies that require care. Catholic schools encourage students to make healthy choices for their lives including healthy food choices. Download the full Healthy Food and Drink Choices Policy. Homework is an integral part of a child’s education. It promotes a relationship that helps maintain communication between school and home. Download the full Homework Policy. Information and Communication Technology (ICT) is utilised in schools for learning, teaching and administration. The availability of such resources provides the opportunity for schools to help students develop their full potential. ICT provides significant educational value but can pose risks regarding safety, personal reputation and corporate reputation. Download the full Information Communication Technology Use by Students Policy. In Catholic education it is recognised that all people are created with the same nature and origin and enjoy equal dignity to develop, make amends, reconcile, restore relationships and be welcomed back with love, acceptance, forgiveness and support. Download the full Justice Education Policy. St Mary’s School is committed to reduce the traumatic effects of crisis situations both in the short and longer terms and accordingly shall ensure that adequate and appropriate measures are in place to manage the response to traumatic events. Download the full Lockdown Plan . Schools are required under the Privacy Act legislation to ensure that where confidential information is collected, that it is managed in such a way as to preserve the dignity of those involved and to maintain confidentiality. Download the full Management of Confidential Information in School Policy. St Mary’s School requires information about students and their families in order to provide for the education of these students. It is important for schools to recognise the significance of protecting the information they hold. Children from other countries should also be given an opportunity to access Catholic education in Western Australia where appropriate. Download the full Provision of Services for Full Fee Paying Overseas Students Policy. Religious Education is the first learning area in the Catholic school curriculum. Download the full Religious Education Policy. The role of the Catholic school in supporting Sacramental programs for young people is to nurture strong partnerships between families and parishes. Download the full Role of Schools in Supporting Sacramental Preparation Policy. Catholic schools in Western Australia are smoke-free environments due to the acknowledged health hazards of exposure to Environmental Tobacco Smoke (ETS) and to comply with legislative requirements. Download the full Smoke Free Schools Policy. 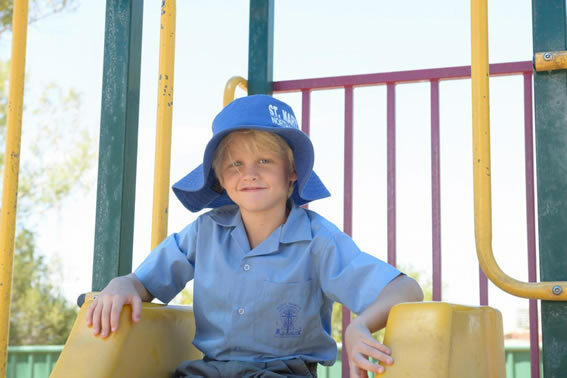 The collection and setting of school fees for St Mary’s School is in keeping with CECWA Policy and is seen by the Bishops of Western Australia as a necessary contribution by parents towards the costs of delivering a Catholic Education for their children. Download the full School Fees Setting and Collection Policy. St Mary’s School, as a Catholic school, aims to help students to integrate culture, faith and life. The values and attitudes at St Mary’s are founded upon the teaching of Jesus Christ. It is these values and attitudes which inform the selection and use of texts at St Mary’s. Download the full Selection and Use of Texts in Catholic Schools Policy. All enrolled students and employees at St Mary’s School shall be protected as far as practicable from skin damage caused by harmful ultra violet radiation (UVR) through the implementation of a mixture of personal and environmental strategies. Download the full Sun Protection Policy.